I don’t think Superdrug is many people’s first choice for over 40s skincare, since the store itself is often so full of teens. It doesn’t feel like a place we would go, unless we’re shopping for our teen. But it’s full of treasures, especially in their own brand ranges. The biggest tip I can give you with Superdrug is not to go in at the weekend, because that’s when the teenagers descend, and they will all look at you like you are dinosaur poop. Go in during school hours, or sign up for their beauty card to get free delivery of online orders. Probably the best-rated own brand range from Superdrug is B. Skincare. It’s split up into phases, designed for everyone from twenties to sixties and beyond. So if like me you’re in your forties, then you simply look at Skin Phase 2 or 3 and know that it was designed with people like you in mind. The packaging is fresh, simple and elegant, with flashes of grey, white and red. Best of all, there is no annoying guff about what a terrible thing ageing is – my pet hate when it comes to products aimed at anyone over 21. First up we have the B. Pure Micellar Oil (150ml, RRP £6.99; currently reduced to £3.45). I’m sure you’re very familiar with micellar water. It’s basically water containing tiny particles of oil (these are the micelles) and is generally used as a light cleanser. Micellar Oil is a step up from this. The packaging refers to it as an ‘Oil to Milk cleanser’ which sounds very lovely and revolutionary until you realise that all oil cleansers go milky when they emulsify (mix with water). Vichy also do a Micellar Oil cleanser, but it’s about double the price of this one. It’s a thorough and effective oil cleanser with added Vitamin E for all skin types, even very sensitive. The instructions recommend using this with cotton wool pads, though I preferred using a few drops to massage the face instead. I am a rebel. And also someone who doesn’t read the instructions. 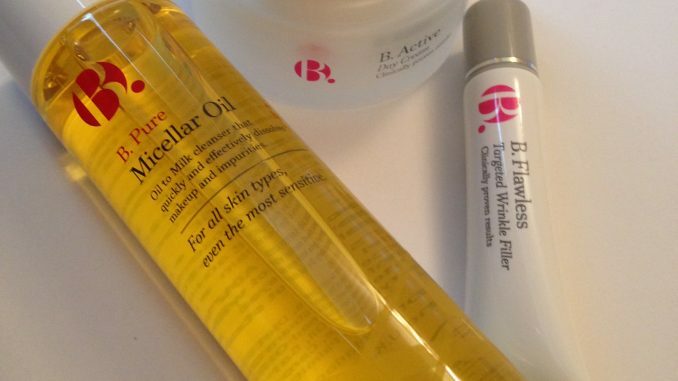 The next product I tried out is the B. Flawless Targeted Wrinkle Filler (15ml RRP £9.99; currently reduced to £4.95). We’ve looked at a couple of filler creams before, so you know that creams like this will never permanently get rid of wrinkles, but they can help them look less obvious by plumping out the skin. What’s interesting about this one is that you apply it very sparingly on top of foundation but before powder. You have to put it on it quite carefully then leave to dry so the silicones it contains will smooth out some surface lines and help pores look less craterous. The reviewers on Superdrug’s site are reporting particularly good results in using this on lines around the eyes, and I also found it was surprisingly effective on this area. The other product I’ve been trying out is the B. 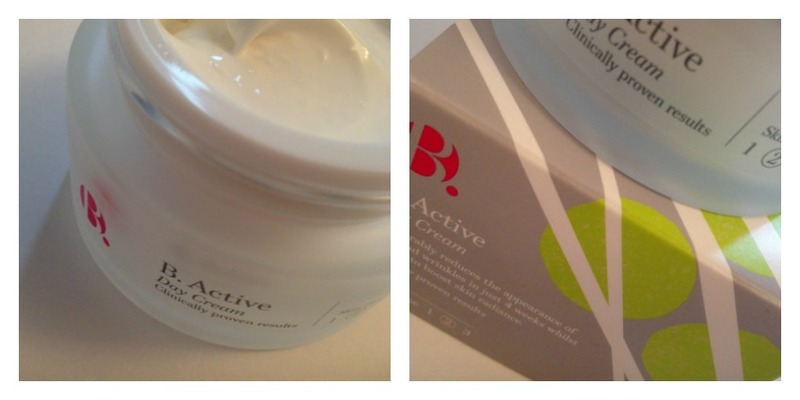 Active Day Cream, a medium-weight daily moisturiser that’s smooth and thick as whipped cream. Can’t find this exact one online, but the other daycreams in the B. range are £11.99, currently reduced to £5.95. Containing SPF 15 and top quality skincare ingredients including hyaluronic acid and niacinamide, this is great for keeping your skin hydrated without greasiness all day long. While we’re on the subject of B Skincare, I want to recommend the B. All Lengthening Defining Volumising Mascara which is a rare beast – a decent tubing mascara at high street prices. I’ve been buying it for a few years, so I can tell you that the £9.99 price tag often gets cut in half. Wait long enough and a discount will appear. And whilst you’re in Superdrug hoovering up goodies I’d also recommend the Naturally Radiant Hot Cloth Cleanser, which is widely regarded as a bargain dupe for Liz Earle Cleanse & Polish. It’s usually priced at £5.99 but is currently reduced to £2.95 for 200mls – the same size in the Liz Earle would set you back £26. Everybody’s budget is different, and sometimes with higher priced brands what you’re paying for are the adverts in magazines or counters in department stores; not necessarily for what goes in the jar. And I don’t think having a lower budget should mean that you have to settle for less in skincare. So I hope you get a chance to try this range out – at these prices it would be rude not to. 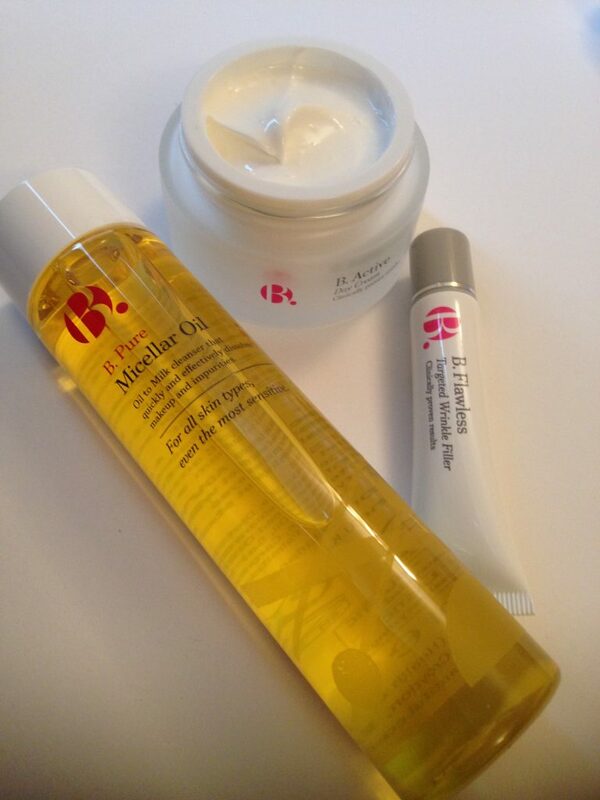 The B Skincare range is available online and in store at Superdrug. It’s currently on a ‘Better than half price’ offer.